Desh Bhagat University in its ongoing endeavor to promote Research and Employability in Higher Education of International standards in India, today signed a Memorandum of Understanding (MoU) with U.S. based Company Equity Score LLC. While unveiling this news, Chancellor Dr. Zora Singh said that MOU will provide various opportunities of jobs through Equity Score LLC for the youth. He added that after this MOU, the university will offer lakhs of new jobs for Graduate Students. Dr. Singh further informed that Equity Score LLC will establish a Research Center in the university which will be the first Center of its kind in India. Professor Paul Douglas Katchings, who is Advisor to Equity Score LLC and part of association is being designated as Professor-At-Large at DBU, addressed the press conference and said, “New Partnerships will create 100,000 new part-time jobs for New Apps creation with new teams, the modern communications tools used today, and a new Certification Program from the Desh Bhagat University that will increase financial literacy about public companies and enable collaboration across multiple disciplines. 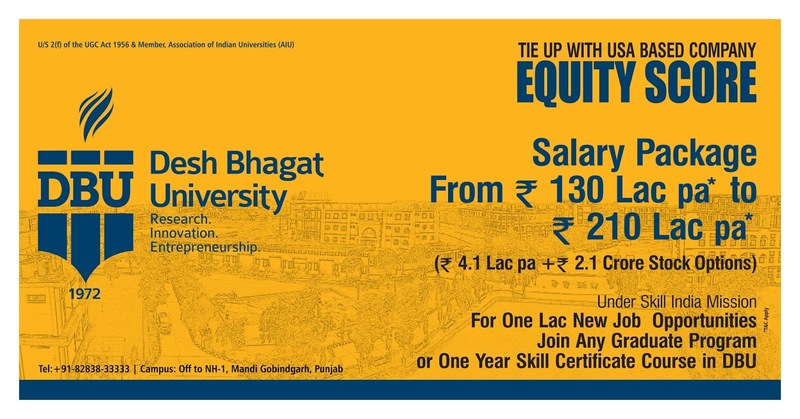 A new Certificate Program at Desh Bhagat University (DBU) has been instituted to organize students and professionals into special teams that we call Skills 31 Teams®. We are looking for exactly 100,006 interdisciplinary engineers to get organized into 3,226 teams. The base income for each team member will range between $300 to $520 a month along with stock options valued between $202,000 and $313,000”. Professor Paul further said that Engineers are good at solving problems. As long as their work meets the needs of society – as long as what they make is useful to society – then good results are manifested. Engineers must work with architects, sociologists, musicians, cinematographers and people trained in other non-engineering disciplines.